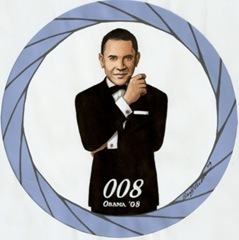 While Barack Obama received the endorsement for President from such power brokers as former Secretary Colin Powell and billionaire Warren Buffett, the backer with a real punch is 007. That’s right Bond, James Bond. Well actually the endorsement came from Daniel Craig, the actor that plays Bond in Quantum of Solace, the 22nd Bond film which will open in US theaters On November 14th. The advance reviews are as good as anything before it. And who does he think would be the better Bond girl—Michelle Obama or Cindy McCain? Tagged with Election 2008, President Barack Obama.